Microsoft combines the portability of a tablet and the performance of a laptop with the 2017 version of the Surface Pro 12.3" 128GB. Weighing just 1.70 pounds and measuring just 0.33" thin, the Surface Pro packs a 7th-Gen (Kaby Lake) 2.6 GHz Intel Core i5-7300U processor into a magnesium casing with a silver finish. Use the multi-position Kickstand and the Surface Pro Type Cover (sold separately) to turn the Surface Pro into a laptop. The updated Surface Pen (sold separately) provides up to 4096 levels of pressure sensitivity. The Surface Pro features a 12.3" PixelSense display with a 2736 x 1824 screen resolution (267 ppi) and a 3:2 aspect ratio. The display also supports 10-point touch, so you can take full advantage of the multi-touch gestures incorporated into Windows 10 Pro. If you want to play video on an external display, you can do so using the Mini DisplayPort output. The Intel Core i5-7300U processor has a base clock of 2.6 GHz and can be boosted up to 3.5 GHz when performing demanding tasks. It also has integrated Intel HD Graphics 620. The Surface Pro has 8GB of RAM, a 128GB solid-state drive, a microSD media card slot, 802.11ac Wi-Fi, Bluetooth 4.0, a 5MP front-facing camera, an 8MP rear-facing camera with 1080p HD video recording, and dual integrated microphones. There are also built-in stereo speakers with Dolby audio. Windows 10 Pro is the installed operating system. The Pro version of Windows 10 includes all of the features of Windows 10 Home plus many designed specifically for business users, including Hyper-V virtualization, BitLocker disk encryption, and remote desktop access. Devices will also be able to join domains and the Azure Active Directory, and they can even access a specialized version of the Windows Store featuring custom, company-specific applications. Featuring a 2736 x 1824 screen resolution with 267 pixels per inch, the 12.3" PixelSense display provides a high-res, clear viewing experience. Use the multi-position Kickstand for a hands-free way to watch movies. The display is also a touchscreen, so you'll be able to utilize the multi-touch gestures incorporated into Windows 10 Pro. You can also output video to an external display via Mini DisplayPort. Featuring Intel dual-band 802.11ac Wi-Fi, the Surface Pro delivers faster internet access, broader coverage, and longer battery life than was available with previous Wi-Fi standards. The Surface Pro is also backwards compatible with 802.11a/b/g/n Wi-Fi networks. 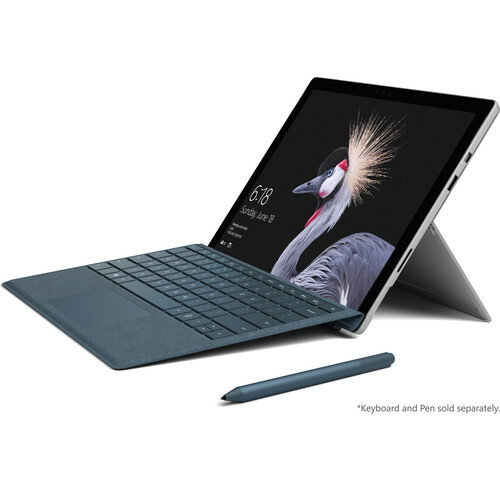 The Surface Pro also comes with Bluetooth 4.0, so you'll be able to connect wirelessly to Bluetooth-compatible peripherals and accessories. 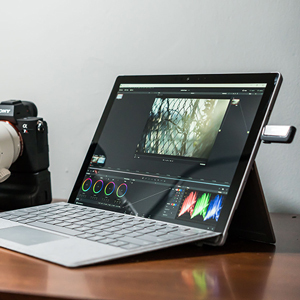 Weighing in at 1.70 pounds and measuring 0.33" thin, the Surface Pro can be used in classes, at meetings, or on the road. The bright, responsive touchscreen and the high-quality speakers with Dolby audio provide an immersive viewing experience, while the front 5-megapixel camera allows you to video chat with friends and family in high resolution. Box Dimensions (LxWxH) 12.75 x 9.1 x 1.9"
Surface Pro 12.3" 128GB (2017, Wi-Fi Only, Silver) is rated 4.0 out of 5 by 1. Rated 4 out of 5 by Bob from Satisfied I am still working with this new tool, So far, I am enjoying it and finding it helpful. The functionality is good and bring lightweight is a huge plus. Only negative thus far was the poor FedEx delivery. Is there a compatible car charger for the Surface Pro 2017 ? We don't have a dedicated car charger for the Surface Pro but you may charge it using a power inverter like the B&amp;H # WA23486.